So recently I interviewed Paul Barnes as part of AccountingWEB’s Practice Excellence series. Paul is the owner of My Accountancy Place in Manchester, which is a Xero Gold level firm of accountants that specialises in servicing Digital Creative Agencies. Over the past 12 months they have been able to deliver massive value to their clients by leveraging their entire team. When I first met Paul, he was the main sales person, which is typical of many accountancy firms. He was the one involved in every sales meeting because his team hated the idea of selling, they hadn’t been trained in it and they didn’t have the tools do it effectively. This was leading to another greater problem, which is the fact that if you have one person doing the selling (making the promise) and someone else delivering the service (delivering the promise), then you always get a level of disconnect between what the client expects and what they receive. And because you only have one person driving sales, invariably you end up with clients who need more from you and who want more from you, but who get let down because your team aren’t selling those additional services. The knock-on effect of this is that your clients become frustrated because they don’t receive the full value of your service and your team become frustrated because they inevitable become undervalued by the client. The outcome is that as a firm, you don’t make the income your capable of making because you’re not delivering the value you’re capable of delivering. At the end of the day, it all comes down to selling, because selling is to serve. So Paul and I worked together to train his team in ‘consultative selling’ and to give them the tools which they needed to sell easily. We changed their mindset and taught them that to sell is to serve. We also taught them that not to sell all a client needs, is to be unfair to them. We also developed what is now called GoProposal, which is an online system that gave them the power to easily produce proposals for prospects and clients, and to get them signed off. Very quickly, we had his entire team carrying out proposal meetings, signing up new clients and selling additional services to existing clients. In one case, one of his accountants brought a new client on board for a £1,500 a month fee, and Paul had never even met them. This is incredible leverage and everyone wins; you, your client and your team. 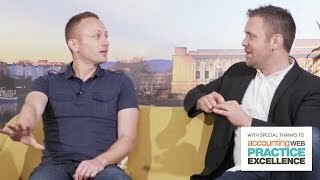 This is part of the interview that was carried out with Paul where he talks about leverage and which was provided to us courtesy of AccountingWEB.